Is It Time For You To Go On An 'Information Diet'? "If we want to make media better then we've got to start consuming better media," says open-source-Internet activist Clay Johnson. 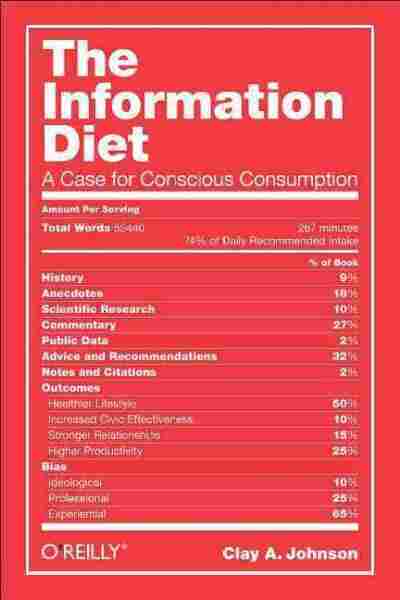 His new book, The Information Diet, makes the case for more "conscious consumption" of news and information. Is It Time For You To Go On An 'Information Diet'? We're used to thinking of "obesity" in physical terms — unhealthful weight that clogs our arteries and strains our hearts. But there's also an obesity of information that clogs our eyes and our minds and our inboxes: unhealthful information deep-fried in our own preconceptions. In The Information Diet, open-source-Internet activist Clay Johnson makes the case for more "conscious consumption" of news and information. Johnson, the founder of Blue State Digital, which provided the online strategy for the 2008 Obama campaign, talks with NPR's Scott Simon about ways to slim and stretch our minds. "Our bodies are wired to love salt, fat and sugar. ... Our minds are really wired to be affirmed and be told that we're right. ... Who wants to hear the truth when they can hear that they're right? Who wants to be informed when they can be affirmed? What we do is we tell our media that that's what we want to hear, and our media responds to that by telling us what it is that we want, and sometimes that isn't what's best for us." "I noticed that because of our media diet, we were consuming everything that was great about Howard Dean. Even after that scream incident in Iowa, we still thought we could win and that we would make it, and we went on to New Hampshire and South Carolina thinking that victory was just around the corner. That was when I began to see that we can get a little delusional in the world of politics. "That's what made me start thinking: There's something going on here with our rhetoric, and there's something going on here with our media diets, where even the most highly informed of us can be ignorant." 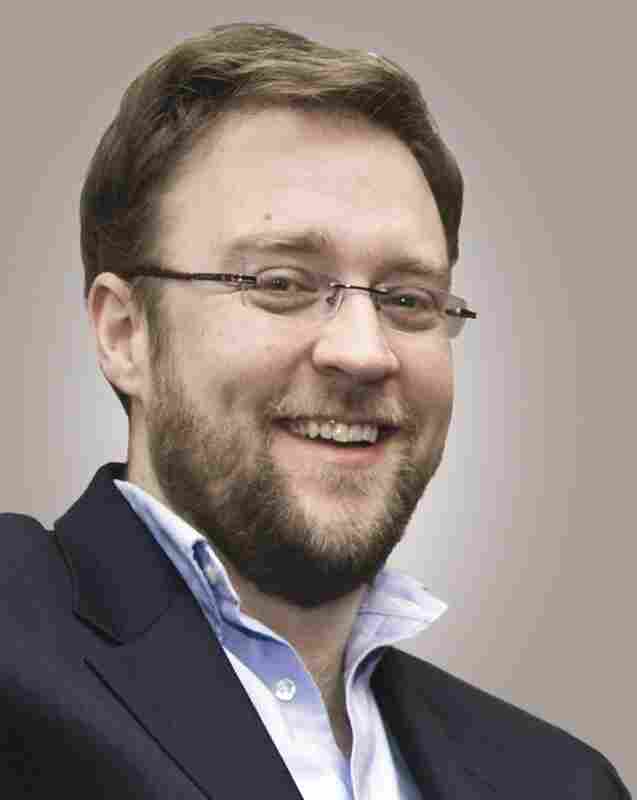 Clay A. Johnson is the founder of Blue State Digital and former director of Sunlight Labs at the Sunlight Foundation. "What choice gives us, what choice of information gives us, is the ability to misinform ourselves in all kinds of new ways. If you can have a discussion with someone next to you who says, 'I think X is correct,' and the other person says, 'I think Y is correct,' and then you can turn around to your mutual computers and then build a case for why you're both wrong — then all of a sudden, that synthesis that has really made ... democracy great starts going away. We lose our ability to synthesize when we can always prove ourselves right." On why your "clicks have consequences"
"A lot of AOL properties and other "content farms" ... who are trying to sort of commoditize the production of content, wake up in the morning and look on Google search trends. Google makes it publicly available what are the top things that people are searching for every moment. So, editorial decisions get made based on this information. It's really this idea of voting for — in very small, almost nontransparent, subconscious ways — for content that isn't very good for people." "Obesity is a complicated problem. Obviously, obesity has to do with access, and obesity has to do with the economic conditions, but it sometimes also has to do with overeating, and the same thing happens with information. I think a lot of people don't have great access to information and good information, that's for sure, but also in the world of the Internet, we have almost universal access to everything that we need. And that means that we have to make empowered decisions and informed decisions about what it is that we're consuming. It's the only way to sort of 'live right' online." If we want to make media better, then we've got to start consuming better media. "Seek. Not too much. Mostly facts. Eat low on the sort of 'information food chain,' and stick close to sources. If it's an article about a bill in Congress, or even at a statehouse somewhere, going deep and actually trying to read the bill itself is really, I think, advantageous. And it takes a little bit of time to pick up. Bills ... [and] house resolutions are not, the most entertaining things to read for most people. But getting to know what our legislative language is helps us, I think, become better citizens." "The question is, can we make enough people go: 'Hey, you know what? I'm done. I'm done with the sensationalism of media. I'm done being taken advantage of by media companies so that I can have ads sold to me.' ... If we want to make media better, then we've got to start consuming better media."